Steel guard rail is one of the best–and most economical–accident prevention tools in a facility’s safety arsenal. It helps keep workers safe from forklift traffic, protects valuable equipment from potential damage, and even guards ends of pallet rack rows. But there may be times when you need forklift or cart access to protected areas (or simply don’t want to step over or around railing). How do you handle those situations? How often are you having to remove your guard rail and then reassemble? There’s a better way available — lift-out rail systems. Guard rail is meant to be permanent, right? In most situations, you have no doubt that you want that guard rail there for good. You’ve established your traffic patterns, know what access points you want to have and how to handle those adequately. You devise a guard rail system of the appropriate height and strength needed then realize that from time to time large bundles of materials must be delivered to certain locations, machines and equipment must be changed out, or other issues that require temporary access to protected areas. Now what? Including specific sections of lift-out guard rail can be a real advantage for those times when access is needed temporarily. Lift-out guard rail components are a little different from standard guard rail. It has the rails and posts, but also adds rail pockets that bolt onto the post sides. These pockets allow you to drop the rail sections into place to achieve the same strength and stability as traditional bolt-up guard rail. The advantage comes when you need to access an area – you simply lift the rail sections out of the pockets and take care of business. Once you’re done, drop the rail sections back in place and you’re again protected. The beauty of the system is that you can build it out entirely in lift-out sections, or choose particular sections for using lift-out guard rail. 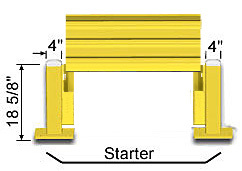 When calculating post positions, keep in mind that the addition of the rail pockets adds 1″ of space required between post centers for the rail to clear the thickness of the pockets where they attach to the post. (This makes retroactively adding lift-out pockets to an existing installation impractical). Also keep in mind the width of any equipment or vehicles using that access point. Make sure the length of lift-out rail is wider than anything you plan to go in or out of that access point. With the addition of lift-out guard rail to your safety arsenal you get to have things both ways — sturdy protection from forklift and vehicular traffic and access to protected areas as needed.